Taste of Cherry comes close to being a great film. Its much discussed ending that breaks the fourth wall to reveal what has just been witnessed is all a film, is one of the worst conclusions for a film of this high caliber. 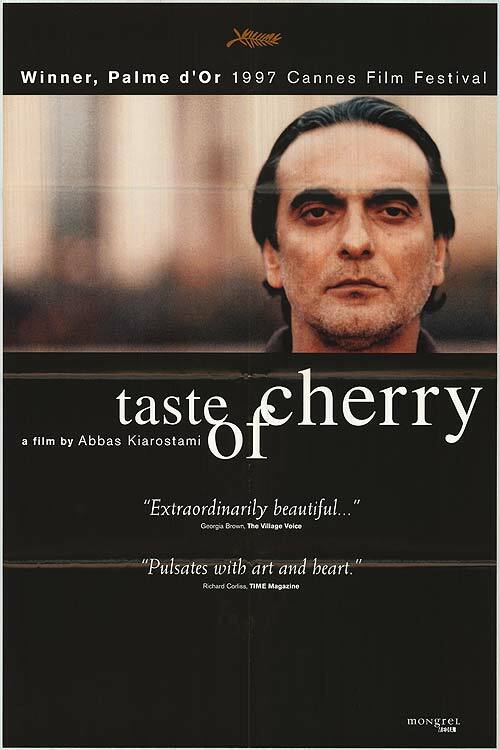 The basic problem with the ending of Taste of Cherry is that the big revelation that intentionally alienates the viewer from the medium comes after we have been emotionally prepared for more than ninety minutes to probe a question of deep philosophical nature. The unfortunate ending emotionally deflates the whole story. Many claim that in Taste of Cherry, Kiarostami consciously renounces the role of a preacher, rejects formulaic tearjerking plots, or he wants to embrace indeterminacy as the film’s major motif. Yet, before the ending of the film, it is not preachy, jerks no tears, is clearly fictive, and the penultimate scene spells out indeterminacy far more powerfully and cogently than the ending does. The fact of the matter is that Kiarostami did not believe enough in his film to let it end at its best point. The narrative is rather simple. A stony Mr. Badii drives about the outskirts of a small Iranian desert town in a Range Rover. Mr. Badii is looking for a help, of course, in exchange of a princely sum of money. The job is to check up on him the next morning, in a grave that he has dug. They are to see if he is dead or alive, after he has taken a bottle of sleeping pills. If alive, they will assist him out of his grave. If dead, they will heap dirt on his corpse. Kiarostami makes is to never reveal the source behind Badii’s suicidal anguish. Manifestly, Badii does not really want to die. If he wanted to die he would kill himself and not care what happened to his corpse. As Badii drives, he picks up is a young Kurdish soldier, barely out of his teens. When he is driven to the freshly dug grave he runs away as fast as he can. He is similarly rejected by a young seminarist from Afghanistan, whom he meets when he arrives at an abandoned factory. Finally, Badii finds the man and Kiarostami consumes several minutes before we see the man’s face, which shows Kiarostami building tension. We want to see what sort of man or monster would assist Badii. He is just an old Turk taxidermist, Mr. Bagheri, who needs the money for his own child’s medical bills, and regales Badii with a joke and a tale of how he was prevented from suicide, himself, in 1960, by the taste of cherries from a tree. It is worth noting that the three would be executioners Badii picks up are all not ethic Iranians or Persians, but minority groups from other countries, a point that no published critic I’ve read seems to have noted. As the film ends, Badii seems to have second thoughts, for after dropping off the old Turk at his job, he pursues him and asks him to make extra sure he is dead before heaping the dirt on him. He then walks off, satisfied, and watches the sun set. He then makes his way to the grave, gets in, then the screen goes black for a while, and we seem to hear rain, the sign of life’s renewal. Then, the fourth wall is unfortunately, and superfluously, broken. While most critics have picked up on the rightness or wrongness of suicide as being a theme of the film, the deeper question is really whether or not a person will violate their own ethical and moral codes to help another person in immense pain? The latter question seems to have itself answered in the affirmative, even if it takes some effort to find a human being. Some critics claim that the film’s ending is anti-escapist, when in fact, the ending is the ultimate escapism, for all that the viewer has been asked to emotionally invest in beforehand is revealed as nothing of deeper consequence than a philosophical posit. Some may claim, though, that Kiarostami wanted to dispassionately analyze the broader question at hand, much like a philosophical question dipped in logic. Taste Of Cherry has moments of pure cinema where images speak for themselves, and indeed do last longer than the lesser parts of the film. The ending does not completely ruin the film, but it makes it fall short of achieving greatness. Taste Of Cherry’s resolution is a startling one; Kiarostami has had to defend its seeming illogic and eeriness in several interviews. He usually does so with another shrug: "I did think this was a really big risk, but it was a risk worth taking. Even when I hear people arguing about the ending of the film, I like it because it means the movie hasn’t ended. . . that the film has a life in their minds." 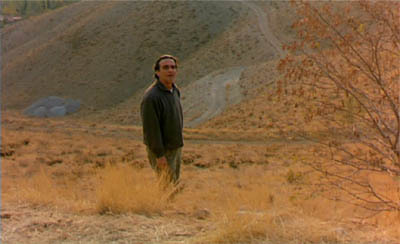 Many of Kiarostami’s films, such as 1987’s Where is The Friend's Home, feature children on metaphorical journey whose real ends are not made clear. It has been a struggle, but Abbas Kiarostami has found a way, even under the eyes of the Iranian regime, to say exactly what he wants to say. That many of his films seem like elaborate, essentially wordless, parables is not coincidental. For all their seeming Otherness, believes Kiarostami, post-Revolutionary Iranians are walking a universal path. Theirs is the same slow, painful trudge across the forbidding mountains and into an ever-receding middle distance that all modern souls have to make. Thus, the journey of Taste Of Cherry is less an Iranian one than a human one. And by taking it, we may find commonality with a culture whose ways Westerners have yet to come to grips with. Interesting that you are into Kiarostami's work and even write about it...I am from Iran but not much of a fan of his work. However, it is delightful and interesting to see a foreign bright guy writing about his movies. Cinema (for that matter any artistic endeavours) knows no boundaries, I believe.